leather. black and camel. bomber. maybe a couple months ago? thanks miriam! xO! I love love love your bomber jacket layered over legging skinnies. I am a sucker for jackets as I find they are perfect for layering and turning any dull outfit to fab! Did you recently get this jacket from Zara? couple months ago vee! thank u ! xO! love the camel and black color combo! fabulous jacket! love the mixing of the two colors! WOW. THIS JACKET IS GORGEOUS! That jacket is gorgeous! Love the color! omg that bomber is gorgeous!! and i love how you styled it keeping it simple with those pants and super chic shoes! That jacket is in one worth: gorgeous! Those heels from Mango are just to-die-for! iono! you should check!!!! got it a couple months ago! xO! ZARA and TOP SHOP gift card giveaway on http://www.fashion-a-holic.com for $400 each! 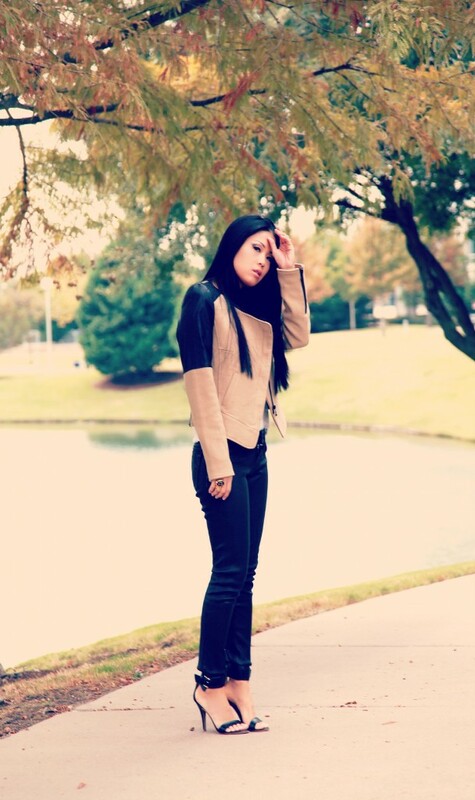 So perfect & haute…..that bomber is truly a bomb in every sense of the word Sooae!!! Wow, really amazing outfit. Perfect style. Have a nice day. Beautiful, I love the leather pants and the leather detailing on the pants together! Okay, you are officially the queen of cool! Seriously adore everything about this look. Can I just say how I love how you always do neutral colors with a little pop of color! So classy and timeless. And that leather jacket, hot CHA CHA!! I love this jacket! You look so gorgeous. And you are totally rocking those leather skinnies like a pro! Way to go. That jacket is fantastic! That is a gorgeous jacket!! Just when I think I can’t fall in love with your wardrobe anymore, you go and pull out this gem. Seriously OBSESSED with this jacket! Love this jacket, but I’m not surprised. You have the best jacket collection!! Stunning! love the jacket so much! what a great jacket. i have been looking all over for the perfect bomber jacket…this is just what i want! i love it with the feminine shoes and jeans! Would it be completely lame if I said you are the bomb? Ha ha! Seriously though, you are so STUNNING!! This jacket is awesome. That bomber jacket looks great on you! I cannot get over how good you look with leather accents, it’s like they were made for you! You look breathtaking in this pictures… Seriously!! That jacket is just to die for and the leather pants are the stars of the season… Together they make the perfect outfit! Love love love the whole outfit! How is your hair always flawless?? One day you need to post about your hair care! you’re too sweet. thank you! xO! I am so in love with that jacket! That is such a great jacket! Oh so chic and flawless. The whole outfit looks like it was made for you to fit perfectly. Love it. You are looking awesome Sooae! I love all the leather! I LOVE this look! It’s one of my favorites yet! You are seriously rocking it! and I swear, your hair gets more and more beautiful by the minute! I want the whole outfit! You are WEARING it! This outfit rocks :)! Love the whole look, want the jacket! Your outfit is fabulous! Love those sandals! P.s. I’m your newest follower! What a gorgeous jacket! I like how you’ve paired it with the jeans. Very nice look. Your jacket looks totally chic and perfect! That is one snazzy jacket. Zara makes the BEST clothes! i am loving that jacket!!!! going straight to zara now! Pretty jacket… great color combo! Have a great day! I love this. So simple, so chic – you look beautiful! Great jacket, I love this look on you – so simple but chic! Love the jacket and the leather skinnies. So pretty!!! your jacket is amazing, you look great! Great bomber jacket!! You look amazing as always! I wish I look as good as you in leather skinnies. I need that jacket!! off to check it out at Zara. I love that jacket! The pants are awesome too, looking fab as always. Gorgeous! That jacket is SO you! Absolutely smitten with your jacket!! OMFG i am soo in love with that bomber jacket, argh!! zara’s winter jackets are such a must right now, did you get to see their winter collection?? in love i can definitely see that you’ll love them too!!! this outfit is amazing.. major looove!! This outfit is stunning on you. Show Stopping. This look is super chic, you’re for sure the hottest mom around town!! Wow…. what a stunning jacket! Fabulous! oh, this is super chic~! your jacket is amazing, dear~! You look fantastic! I am in love with that jacket. If you get a chance I’d love to hear your thoughts on my latest style post. Hey Babe! You have such great style. And the tour of your closet… it’s super enviable!! I really love this combined leather jacket of yours. Zara does not wrong. It’s unfortunate that we don’t have a Zara location here in Hawaii, but thank goodness for their online shop. My only quam with Zara is the inconsistency in sizing… at least when I order online. Well, I hope you enjoyed your weekend, love. That jacket is stunning! I just love the colours and shape! You look so chic, as always! This entire outfit is fabulous!! Love it! I am obsessed with the Mango sandals. Loving your Zara Bomber Jacket!